After I saw the musical Billy Elliot last December, the sheer joy and beauty of dance inspired to go to the ballet. So I bought a ticket to the James Sewell Ballet at the Southern Theater. And then I saw the movie Black Swan and was a little creeped out by it all. Fortunately today's show was not creepy at all, it was beautiful and intriguing and funny and moving. I know next to nothing about dance; I've only been to a few dance productions in my life. So I didn't necessarily get everything I saw today, but I was mesmerized by it. 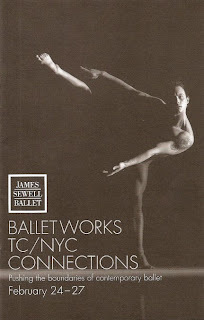 Ballet Works is a series of five pieces by different choreographers; the company does it every year as a way to work with new choreographers and let some of the dancers choreograph. James Sewell and some of the choreographers were there to introduce and talk about their pieces. It was pretty casual and somewhat interactive; before his solo piece James led the audience through some activities to help explain what he was going to do. His piece, "Body Puzzles," was about different limbs doing different things at the same time, like patting your head while rubbing your stomach. Of course what he did was much more complex and intricate than that, and really cool. The other solo piece was called "Dressage" and involved the dancer, Nic Lincoln, attempting to stand, walk, and then dance in super high heels. It was only when choregrapher Judith Howard spoke after the performance that I understood that he was a foal learning to walk. Either way, it was beautiful and fascinating to watch. The other three pieces involved five to seven members of the eight-person company. The hardest part with the group numbers is that often there were multiple things going on at the same time and it was difficult to watch them all. There was quite a range of dance styles and movements. My favorite was probably the last one, "things fall apart" choreographed by one of the dancers, Chris Hannon. It seemed a little closer to musical theater, a world I'm much more familiar with and comfortable in. It was a joyous number and a good way to end the show. I enjoyed my foray into the ballet world and I look foward to more! Theater is still my first love, but an occasional trip to the ballet is a nice supplement to my steady diet of theater.